Scented, soft blue flowers with yellow beards in May and June and strap-like, semi-evergreen leaves that are green-grey and cream striped. 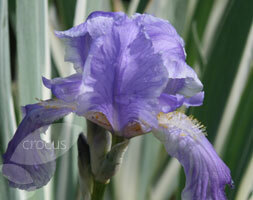 This variegated, bearded iris looks spectacular all year round. Perfect for a sunny, well-drained, mixed border, the tall branched stems need staking with bamboo canes in windy, exposed areas.